9 Comments This post may contain affiliate links. Preparing allergy-friendly weekday breakfasts in advance can be… complicated. If I don’t make breakfast in advance, on busy mornings, I usually am stuck drinking a protein shake because, even if I try my hardest to, I nevvvvver wake up early enough to cook anything substantial. 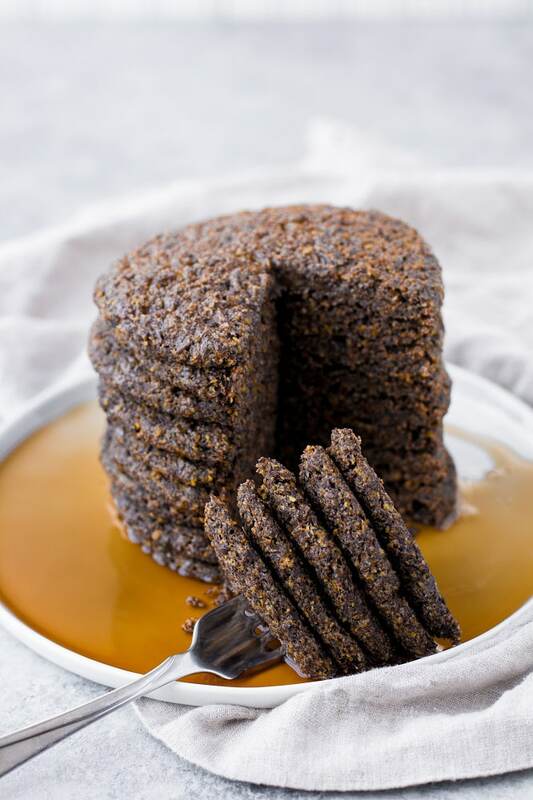 Luckily, these Vegan Keto Pancakes are SO EASY to make ahead of time and store perfectly in the refrigerator or freezer, so I can make multiple batches on a Sunday and have breakfast ready to go for weeks! On top of breakfast meal prep (or any meal prep…) being difficult and time-consuming, I also reallllly don’t enjoy standing over the stovetop flipping pancakes one-by-one. That’s why these baked pancakes are so great! You scoop the batter on to a baking tray, put them in the oven, and voilà: breakfast for the week is DONE! These pancakes are not only incredibly simple to prepare, they are very allergy- and diet-friendly! 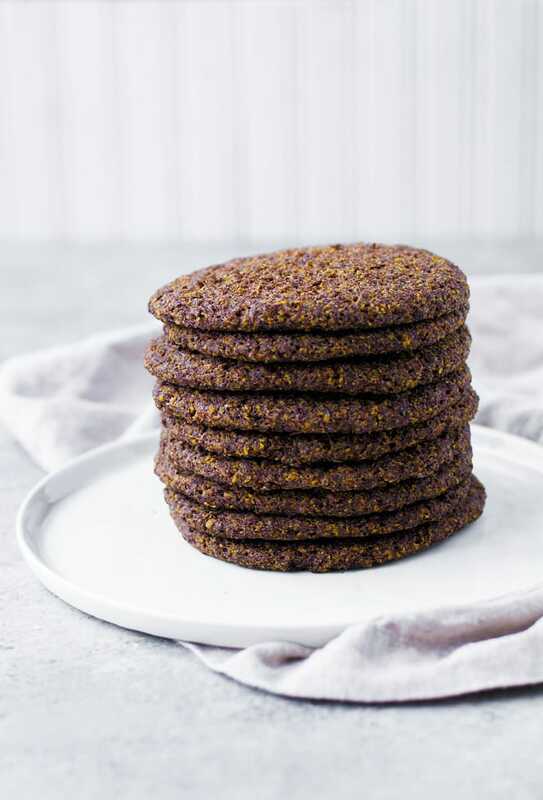 Made without dairy, eggs, nuts, or soy, they are both vegan and paleo-compliant! Keto and Low Carb: One pancake contains 2.3 grams net carbs per serving. 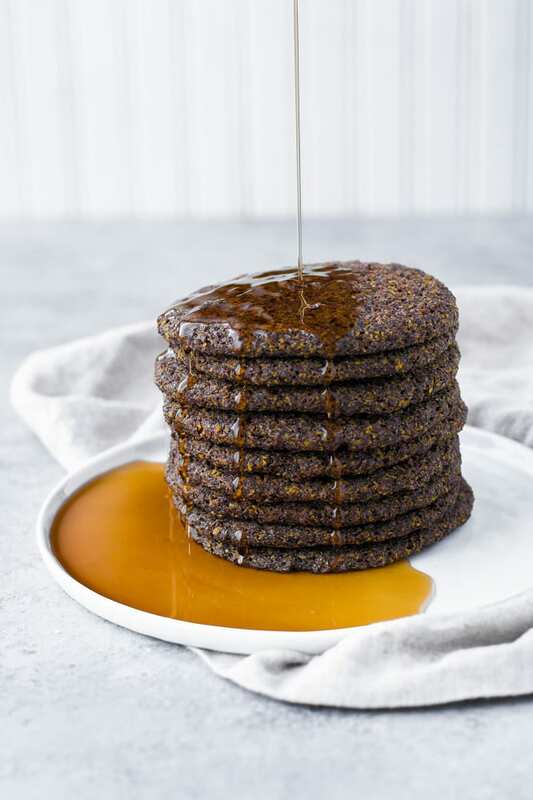 Paleo: These pancakes are paleo-friendly as they are free from any ingredients containing dairy, grains, gluten, or soy. Dairy Free: Coconut oil is used in this recipe in place of cream, milk, and butter. Egg Free: This recipe utilizes ground flax seeds in place of eggs. Flax seeds are a fiber-rich, vegan alternative to eggs. Nut Free: These pancakes are made without nuts or nut flours. Gluten-Free and Grain-Free: This recipe is free from flour, making them both gluten- and grain-free. Vegetarian and Vegan: There are no animal products in this recipe making them both vegetarian and vegan. One pancake contains 2.3g net carbs per serving. 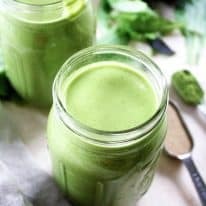 This recipe is keto, low-carb, paleo, dairy-free, egg-free, nut-free, gluten-free, grain-free, vegetarian, vegan, and refined-sugar-free. You can find all Real Balanced breakfast recipes here! 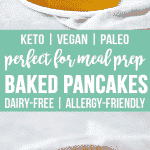 These Vegan Keto Baked Pancakes are the ultimate allergy-friendly meal prep option for busy weekdays! 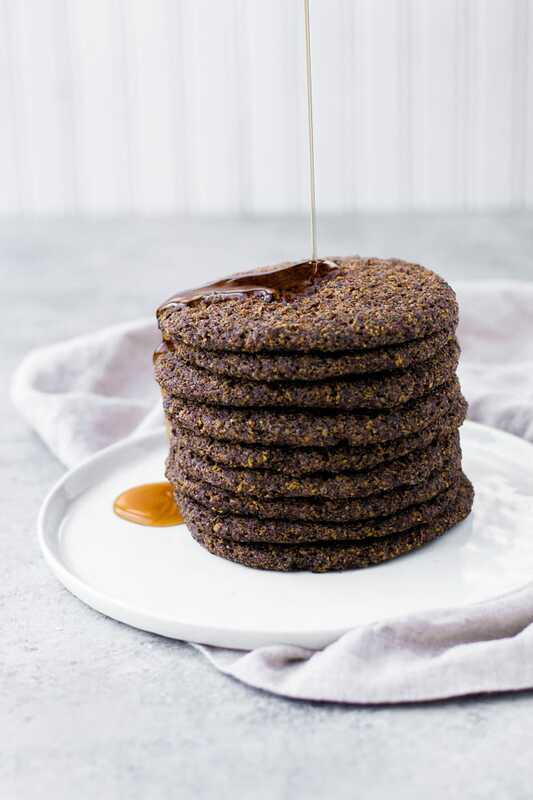 These pancakes are keto, low-carb, paleo, dairy-free, egg-free, nut-free, gluten-free, grain-free, vegetarian, vegan, refined-sugar-free, and only 2.3g net carbs per serving! For the flax egg, to a small bowl, add flax seeds and water and whisk together. Allow to soak for 5 minutes. Meanwhile, combine 2 cups flax seeds, monk fruit sweetener, cinnamon, cream of tartar, baking soda, and salt. Whisk until well-combined. In a small bowl, microwave coconut oil until melted, about 20-30 seconds. 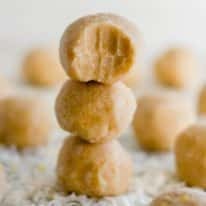 To dry ingredients, add flax egg, melted coconut oil, and water (or coconut milk). Using electric mixer, mix all ingredients until fully incorporated. Allow mixture to rest for 5 minutes. Using a 1/3 cup measuring cup (*see note below), scoop mixture out, roll into a ball, and set atop prepared baking sheet. Lightly press down on mixture to form into pancake. Split pancakes up among the two baking sheets. Bake pancakes in oven for 20 minutes. Remove from oven and allow to cool prior to serving. * I weighed my pancakes using a food scale. Each pancake prior to baking weighed approximately 80-85 grams. Store pancakes in airtight container in refrigerator for 3-5 days or in freezer for up to 1 month. Reheat in toaster or toaster oven. I found the cream of tartar, thanks! Just wondering if it’s monk fruit in it’s liquid or powder form. Also have you ever tried omitting the sweetener and cinnamon and having them as more of a savoury pancake? Granulated sweetener for this recipe (you can click the link to the exact ingredient to see). You could, though, use liquid or altogether omit, if you want! These look amazing! I’m wondering if there is a substitute for cream of tartar? I don’t have any on hand and the small grocery store near my house doesn’t seem to carry it. Thanks! Thanks, Kim! Cream of tartar is in the spice aisle (it’s a powder that looks similar to baking soda). It should be virtually available in every grocery store, so if you’re having trouble finding it, I would perhaps just ask a store associate for help locating it. If, however, they don’t carry it, you can purchase it on Amazon. I don’t have a viable substitute alternative to recommend to you unfortunately. 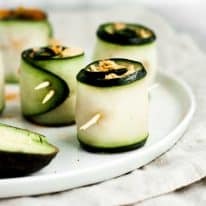 I absolutely love this recipe but I was wondering if it was possible to remove or substitute the coconut oil. I don’t want too much fat without micros! Hi, Patrick! 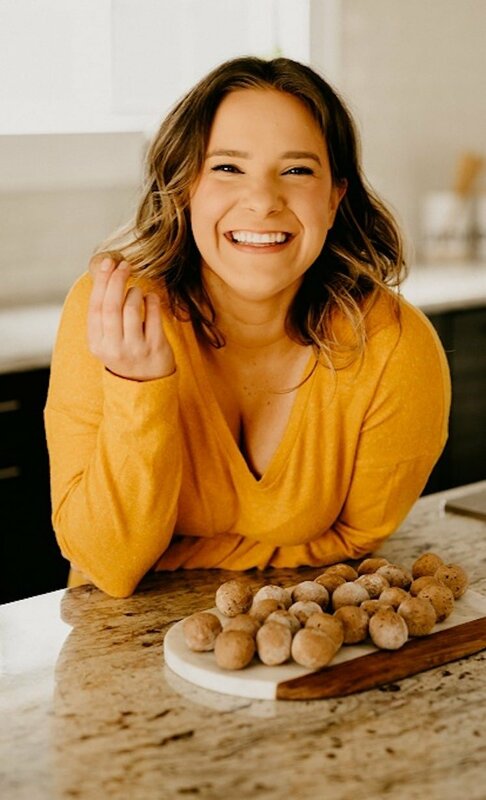 I’m so happy to hear you enjoy the recipe! I’m not sure what a viable replacement would be for coconut oil (other than butter) but, rest assured, you do not need to be afraid of high-fat meals! There are a myriad of micronutrients in the ingredients of this recipe! I’m so glad you enjoyed, Sheila! Thank you for sharing! !